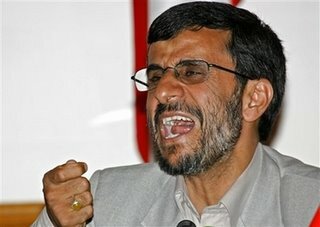 If this is what Iranian President Mahmoud Ahmadinejad looks like when he's calling for a cease fire, I can't wait to see his face when he promises to open the Gates of Hell in revenge for the destruction of his nuclear weapons program. I have to give the man credit though. Even in the middle of an obviously excruciatingly painful cranial bleed, the man has the composure to keep his hand in Bill Cinton's trademark "I'm making a point, without pointing" configuration -- either that or he likes to squeeze the life out of his Diva-worthy rat-snacks before popping them in his mouth. I wonder exactly what he expects to contribute to this cease fire. Certainly he isn't going to try to negotiate with Shimon Peres himself in some Quixotic quest for a Nobel of his own -- sorry dude, that "Peace Prize while preparing to kill the Jews" trick only works once and Arafat beat you to it. But what else could he possibly contribute to the quest for peace in Lebanon? How can Mr. A help bring about a cease fire? Perhaps by sending his envoys of peace? Now they’re sending suicide bombers. Is Tehran stepping up its involvement in the Israeli-Lebanese confrontation? Iran is set to send the first group of suicide bombers to Lebanon on Wednesday, the Iranian news agency ILNA reported. 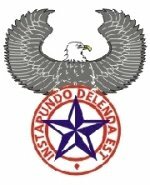 [...] What good are suicide bombers going to do against the IDF, you may be wondering. So was I. Well, apparently, they’re not going to kill Israelis. They’re going to kill Lebanese civilians. Other reports claimed that two groups made up of 27 volunteers have already left for Syria on their way to Lebanon. The volunteers’ task, after having undergone a months-long training, would be to carry out suicide bombings aimed at wreaking havoc and fear around military and civilian targets. According to the report, the group’s mission is to trigger a civil war within the divided Lebanese society, and cause the situation in the country to deteriorate even further. Wow. The President that Time Forgot is so committed to peace that he's sending suicide bombers to help Hizballah reach a ceasefire agreement. I'm not sure how much of an effect they'll have, but it's the thought that counts. The bodies of several Iranian Revolutionary Guard soldiers killed by the Israeli army in Lebanon have been transported to Syria and flown to Tehran, according to senior Lebanese political sources. The information was confirmed by Israeli and Egyptian security officials. It follows scores of reports that Iranian soldiers have been aiding Hizbullah terrorists in Lebanon in their attacks against Isral, including helping to fire rockets into Israeli population centers. Israeli security officials said they have "concrete information" that hundreds of Iranian soldiers are stationed at Hizbullah positions in Lebanon. They said Iranian guards directed the firing two weeks ago of a radar-guided C-802 missile that hit an Israeli navy vessel off the coast of Lebanon, killing four soldiers. Israel says Iran acquired the missile from China. The officials said the Iranian soldiers' duties in Lebanon include keeping custody of long-range missiles within Hizbullah's arsenal, including Zalzal rockets, which are said to have a range of 125 miles, placing Tel Aviv within firing range. 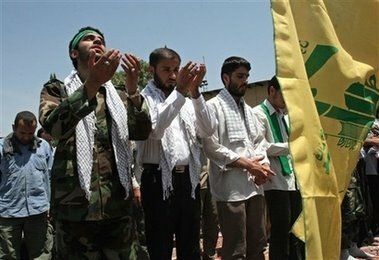 Iran and Syria are the largest financial sponsors of Hizbullah. Israel says many Hizbullah rockets were made or upgraded by Iran. Earlier, Israeli Foreign Ministry Spokesman Mark Regev said Israel has information that Hizbullah was trying to transfer the two soldiers it kidnapped to Iran. Of course Iran has already rejected this "baseless" "Zionist" report in language reminiscint of North Korean press releases extolling Glorious Leader Kim Il Sung's prowess at personally bringing in the bounteous winter harvest. It doesn't get much more convincing. Fling the rhetoric and let the scare quotes fall where they may, that's the spirit! Of course, the Iranians are also rejecting the "baseless" confirmation of that report from "Zionist" Lebanese political sources in addition Egyptian security sources known to be practically Hasidic in their love for the Jewish State. But we'd better get used to reports like these. As Ahmadinejad gets closer and closer to his atomic objectives, we can expect peace to be breaking out all over. // posted by AbbaGav @ 7/26/2006 11:52:00 PM | | | Permalink | EmailThis!